To say the weather has been rather cold lately would be similar to saying fine chocolate is simply good. Additional descriptive words are required to help others understand. At least, words used to be required. Now. I sometimes think advances in technology are taking our command of language back decades, if not centuries. 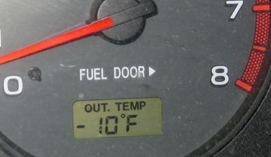 Take for example, how many people share a photo of their vehicle’s dashboard thermometer to let everyone know what extreme temperatures they are enduring. Posted on January 27, 2014, in Family, My life, perspective and tagged 365 reasons to smile, life, musings, perspective, smiles, Thoughts, weather, winter weather, words. Bookmark the permalink. 22 Comments. And most Americans are very jealous of you Australians these days!